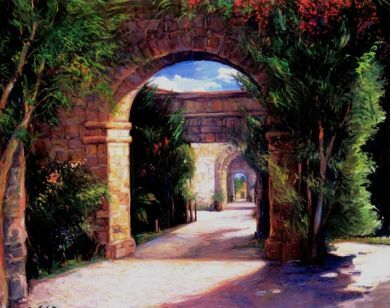 Mexico - Print - Archway - 48x60 unframed canvas $1150. Canvas Open Edition prints: a 48x60 inch print with 5/8 inch side staples ready for framing $1150. This is an Open Edition Giclee/Fine Art Print of an original painting by Sergio Ladron de Guevara. It is available on CANVAS and at some future time may be available on archival paper, also in an Open Edition. An Open Edition means there is no limit to the number of prints done, therefore the prices of the Open Edition images are lower than the Limited Edition prints. Our giclees are of the highest quality. We use the finest inks, papers and canvas available. Several coats of UV varnish ensure superior protection. The varnish adds a beautiful sheen to the work. If you would like 1.5 inch stretcher bars (known as gallery wrap – frame not needed, may be hung as is) they may be ordered through Karen.